Washington's new special envoy to Syria and former Ankara ambassador dashed hopes for a U.S. pivot away from the YPG/PKK terrorist group in Syria. 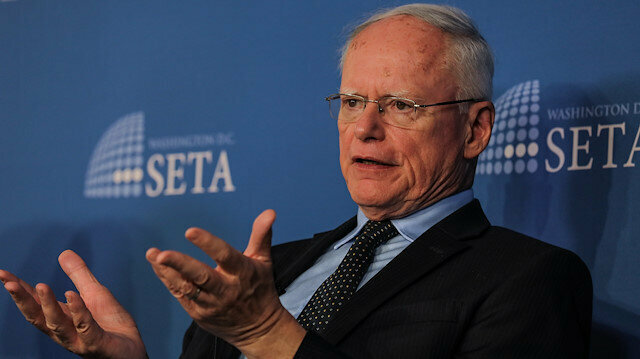 Despite previously being known for his criticism of Washington's support for the terrorist organization, James Jeffrey said on Wednesday during a teleconference that the U.S.' position on the PKK was "clear" and that it did not classify the YPG as a terror organization like the PKK. Serving as Ankara's ambassador from 2008 to 2010, Jeffrey had told Anadolu Agency back in March that the PYD and YPG were both unequivocally affiliated with the PKK. Until recently, Brett McGurk, President Donald Trump's special envoy for global coalition to defeat Daesh, was handling the U.S.' position on the YPG/PKK. McGurk's actions while combating Daesh in fact led the YPG/PKK to spread in Syria. He visited northern Syria multiple times and has pictures taken alongside senior members of the terror group. Jeffrey being appointed in August, 2018 raised expectations for the termination of support to the YPG/PKK under the guise of the Syrian Democratic Forces (SDF) as he toured the Middle East -- including Jordan and Israel. The special envoy has since failed to break from the current policy as officials from Washington continue to hold regular visits to the YPG/PKK occupied territories. The U.S. welcomed the millions of dollars of support given to the terror group by third parties such as Saudi Arabia. Turkish and U.S. troops on Thursday conducted their second round of joint patrols in the northern Syrian city of Manbij, as part of a deal to rid the area of the YPG/PKK terrorist group, Turkey's national defense minister announced.Turkish and U.S. troops patrolled around the Saju Stream, which separates the Manbij frontline from the city of Jarabulus, an area falling under Turkey's Operation Euphrates Shield, according to Anadolu Agency reporters on the ground.Turkish and U.S. troops began joints patrols on Nov. 1.Since June 18, the Turkish Armed Forces have carried out 68 unilateral patrols in Manbij.The Manbij deal between Turkey and the U.S. focuses on the withdrawal of YPG/PKK terrorists from the city to stabilize the region, which is in the northeast of northern Syria's Aleppo province.In its more than 30-year terror campaign against Turkey, the PKK -- listed as a terrorist organization by Turkey, the U.S. and the EU -- has been responsible for the death of some 40,000 people, including women and children. The YPG is its Syrian branch.Operation Euphrates Shield, which began in August 2016 and ended in March 2017, aimed to eliminate the terrorist threat along the border in the northern Syrian regions of Jarabulus, Al-Rai, Al-Bab, and Azaz with the use of the Free Syrian Army, backed by Turkish artillery and air cover. Jeffrey himself had visited the YPG/PKK-occupied town of Manbij in northeastern Syria last month. In response to his remarks, Turkish Presidential spokesman Ibrahim Kalin said on Wednesday that the U.S.’s effort to describe the YPG and its political branch the PYD as legitimate groups with no links with terrorism and the PKK was “futile”. In its more than 30-year terror campaign against Turkey, the PKK -- listed as a terrorist organization by Turkey, the U.S. and the EU -- has been responsible for the death of some 40,000 people, including those of women and children. The YPG is its Syrian branch. The Istanbul Police Department's Counter-Terrorism squads and Intelligence Branch units continue to capture terrorists at “interview rooms” that were formed in 2014 at Atatürk Airport, Sabiha Gökçen Airport and the Grand Istanbul Bus Terminal as part of efforts to prevent people from joining Daesh.Multilingual security personnel, who carry out the interrogations, have been trained on "profiling, risk analysis, monitoring and questioning methods.”According to reports, Turkish counter-terrorism teams have recently started to capture a large number of Kurdistan Workers' Party (PKK) terrorists who seek to escape abroad from Istanbul’s largest bus terminal and airports.On the other hand, the number of Daesh terrorists trying to enter Turkey has decreased.Turkish security forces have been involved in a long-running campaign to thwart Daesh attacks.‘PKK terrorists control 80 pct of drug trade in Europe’More than 300 people have lost their lives in Daesh-claimed attacks in Turkey, where the terror organization has targeted civilians in suicide bomb, rocket and gun attacks.Police have cross-examined more than 3000 foreign suspects in these rooms on suspicion of terrorism in last two years alone.French and British citizens lead the list of foreign suspects who were arrested in connection with terrorism, according to reports.The PKK terrorists who want to escape abroad, mostly head to European countries, particularly Germany and Belgium.The PKK is listed as a terrorist organization by Turkey, the European Union and the United States. The PKK has been conducting armed violence in the southeastern part of Turkey since 1984. More than 40,000 people, mostly civilians, have been killed in the three-decade long conflict. Turkey’s interior minister on Thursday said the PKK terrorist group controls the vast majority of drug trafficking in Europe, earning billions in the process.“Especially in Europe, the PKK controls 80 percent of the drug trade, and it is estimated that the terrorist group earns around $1.5 billion a year,” Süleyman Soylu told a meeting on the war against drugs in the southern Adana province.The terrorist PKK uses its profits from illegal drugs to buy weapons for attacks, he added.On domestic anti-drug efforts, Soylu said Turkey launched 29 percent more operations in the first 10 months of 2018 than the same period last year.Turkey calls on US to end all engagements with PYD/YPGMoreover, in 2017, Turkey launched a total of 70 operations against drug traffickers, versus 68 operations in the first 10 months of 2018, Soylu added.Soylu also accused U.S. support for the terrorist PYD and YPG -- the PKK’s Syrian branches -- of helping to fuel the drug trade. "The U.S. giving 5,000, 10,000, 15,000 truckloads of weapons to the PYD” amounts to trying to make Turkey into a transit route for illegal drugs, he said.Calling this terrorism against Turkish civilization, Soylu said the country does not deserve this.Airport interview rooms formed for Daesh help nab PKK terrorists in IstanbulTurkey has repeatedly objected to U.S. support for the terrorist PKK/PYD as a "reliable ally" in Syria, which has included supplying arms and equipment.In recent days Turkish officials have stepped up their calls for the U.S. to cut its ties to the terrorist group PYD/YPG.The PKK is listed as a terrorist organization by Turkey, the U.S. and EU.In its more than 30-year terror campaign against Turkey, it has been responsible for the deaths of some 40,000 people, including women and children. The PYD/YPG are its Syrian branches. Turkey considers every support given to the PYD and YPG as a direct or indirect support to the terror group PKK, the country’s presidential aide said on Wednesday.Speaking following a cabinet meeting at the Presidential Complex, Ibrahim Kalın said Turkey would never allow a terrorist group's structuring in the east of Euphrates River.Commenting on the U.S. relations with the PYD/YPG, Kalin said: “Turkey's main expectation from the U.S., which is our NATO ally and strategic partner, is to end its all engagements with PYD/YPG, Syrian branch of PKK terror group. "In its more than 30-year terror campaign against Turkey, the PKK -- listed as a terrorist organization by Turkey, the U.S. and the EU -- has been responsible for the death of some 40,000 people, including those of women and children. The YPG is its Syrian branch.